In Shanghai, after a somewhat Kafkaesque flight from Lhasa via Xi'an. 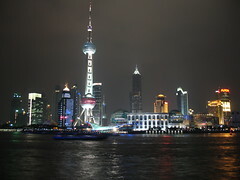 Shanghai is busy and bustling and neon and huge. The forest of skyscrapers I saw being sown ten years ago in Pudong has since grown into their towering, glittering adolescence, and the rivers of bicycles have dried into mere streams, replaced by mopeds and cars. The Bund is still cool. Expats are everywhere and practically everyone under thirty seems to speak a little English. Nanjing Road is a pedestrian mall thronging with stores and crowds, and if you're a Westerner, also full of hawkers offering knockoff watches and bags, and "students" eager for you to visit their "art galleries," and if you're a Western man past dusk, pimps and hookers galore. I haven't seen a single Internet cafe; there's been a government crackdown (can't remember if the pretext is "fire safety" or "they are depraving our young!") but the place I'm staying has a couple free terminals. Tomorrow I ride the world's fastest, coolest train (magnetic levitation! 430 km/h aka 260 mph!) to Pudong International Airport, from whence I shall fly to L.A. and K., hurrah. I am meant to depart at 12:45PM and arrive at 12:23PM on the same day. Look for me in the noon sky. Books for tomorrow's flight: JK Rowling Harry Potter and the Half-Blood Prince, Rudyard Kipling Captains Courageous, Ian Rankin Fleshmarket Close. Wanted to run in Ulaan Baatar but smog and lack of good route defeated me; worked out twice at the local allegedly-five-star hotel instead. Kinda wanted to run in Lhasa but am insufficiently crazy. Would run along the Bund if I was staying here longer. Th-th-th-th-that's all folks. See y'all back in civilization. Well, in California, anyways.